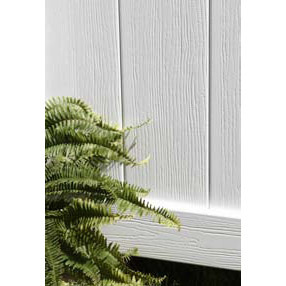 Bufftech Chesterfield CertaGrain Vinyl Fence Sections - Lattice Accent | Hoover Fence Co. 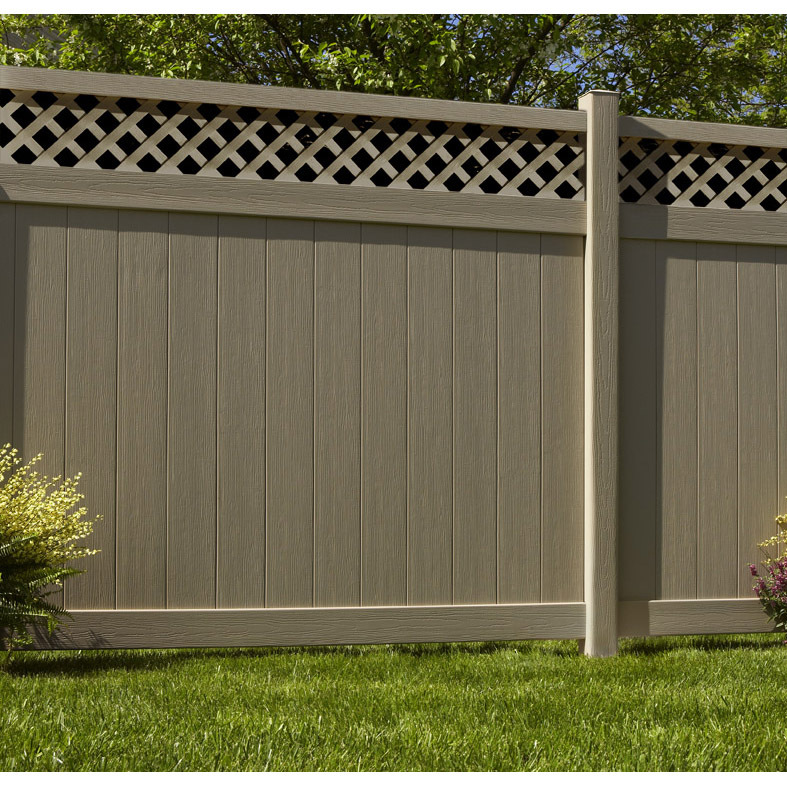 The Chesterfield CertaGrain w/Lattice Accent style features 7" wide "boards" with tongue and groove edges so one board fits inside the other. This is the best way to avoid gaps between the pickets. This style offers total privacy. The bottom rails contain a hidden steel reinforment channel to prevent sagging. Available in 6' height only in colonial white and natural clay colors. Authentic wood grain surface adds to the attractive appearance. 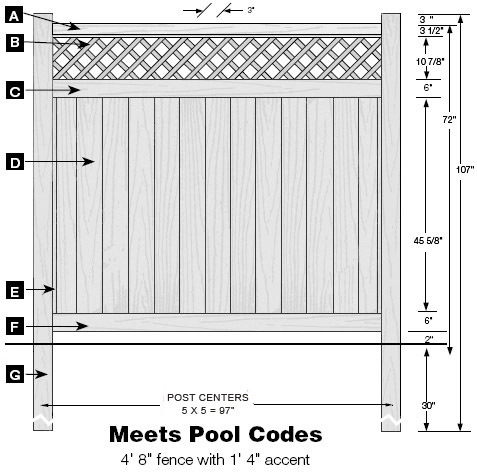 Actual height includes lattice panel at top. Sections are capable of raking out of square to follow grades. Sections include rails and pickets. Matching posts and post caps sold separately. ColorLast™ Dark Color Fade Protection: Exclusive acrylic formulation provides superior protection from the harsh rays of the sun, resulting in richer color that retains it's vibrant hue for years to come. 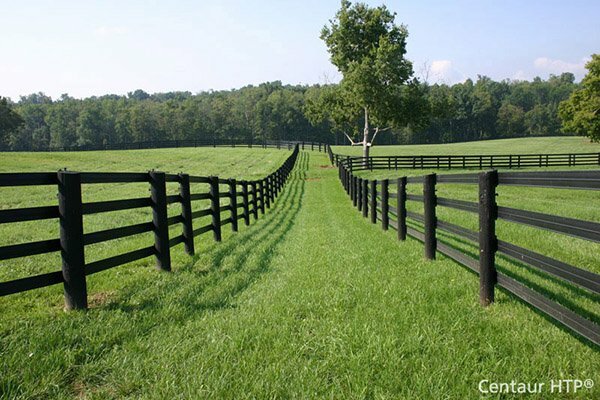 ColorLast is offered in Natural Clay, Arbor Blend, Arctic Blend, Brazilian Blend, Frontier Blend, Honey Blend, Sierra Blend, Weathered Blend, Canyon Blend, and Timber Blend. Not all colors available in all styles. 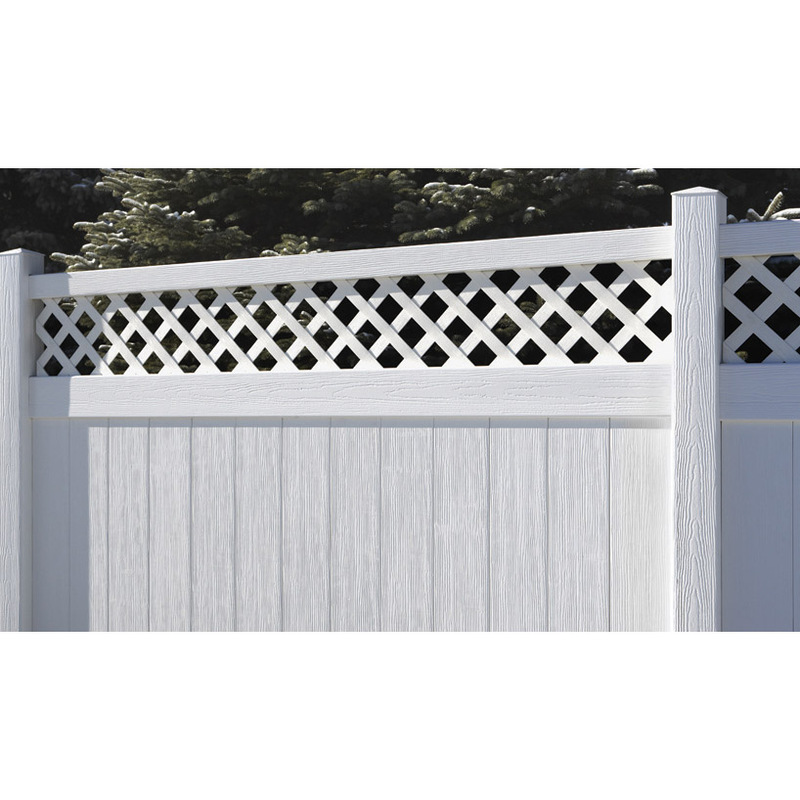 Top Accent Rail (A): 2"x 3-1/2"x 95"
Lattice Accent Panel (B): 1 piece of 15-3/4"x 91"
Bottom Rail (F): 2" x 6" x 95" Rail extruded with channel to accept pickets. Includes steel reinforcement. Post (in-ground) (G): 5" x 5" x 107"